Advertise with Spacing: print and web ads! Advertising with Spacing is an effective form of marketing and outreach because our readers devour each issue, cover to cover. Our ever-expanding readership is a very loyal bunch who share their copies with co-workers, friends, and family (nearly 70% of subscribers collect back issues). By advertising in Spacing, you’re accessing dynamic residents of Canada’s largest cities – these are the people that will shape our urban regions today and in the near future. More importantly, advertising in Spacing gives your organization or company credibility with the people who are influencing an urban-friendly agenda. 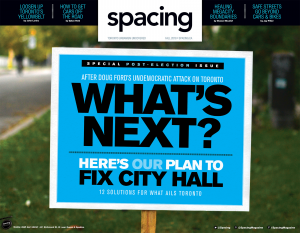 Spacing magazine is published 4 times a year and has a readership of over 30,000, while our blog network attracts up to 20,000 visitors a day. We make sure your ad is the only ad on a page (both in print and on the web) because we want to make sure that your advertisement is seen. Send our ad sales representatives an email and they’ll pass along a PDF of our advertising/media kit.